So first, let’s all take a moment to admire this platter. Let’s also take a moment to agree that blue and white dishes are the dining room equivalent of a little black dress. They are always so right. And now, about the sage. Listen. I get that not everyone feels the same way I do about Halloween. Case in point: Winston the skull-snowglobe. I purchased him last year for Halloween and instead of packing him away in November, he became a year-round member of my office support staff. My other main office support member is this shelf. Her name is Rhonda. You can read about her makeover on my instagram. With all that said, I am a Halloween nut. There is no such thing as too much or too tacky and just yesterday Jane picked up a fake skeleton hand in Target and yelled, “I’m coming for your soul.” Apparently my genes are strong. But some people are classier and don’t necessarily want to cover their homes in fake cobwebs and plastic coffins that yell “enter if you dare” every time a person or squirrel motion-activates it. And retail stores shouldn’t dominate our seasonal decor anymore than they should dominate our home decorating. Case in point, this spider plate. This is the Miss Muffet plate. She was a steal at Goodwill. She’s hand painted and I have zero ideas about where she came from or how old she is (I figured it wasn’t polite to ask). I’m thinking she belongs in a place of honor, like a shadow box. 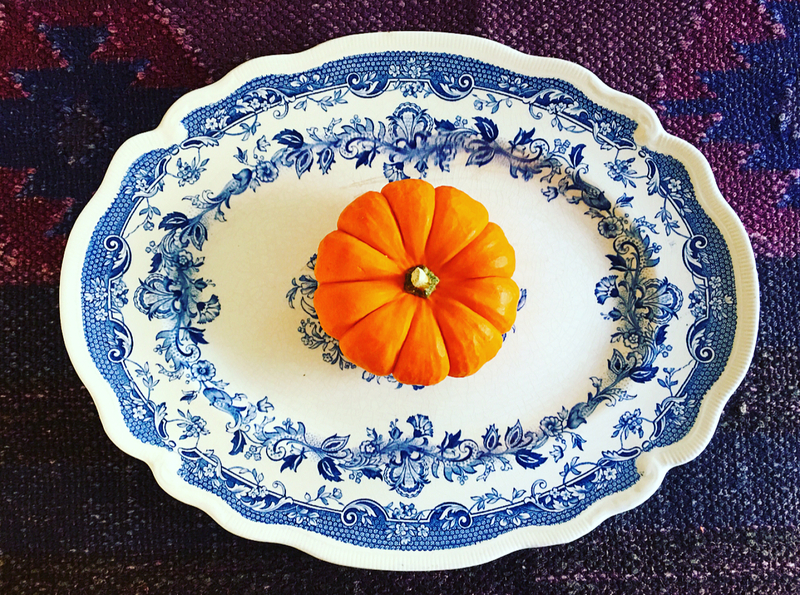 Vintage plates might be the best way to decorate for October and November. They look great on the wall, or better yet, collect some mismatched plates for a tablescape. Pine cones and wheat are great dinner party decor (like this wheat-harvest themed vintage platter on my etsy page). Yes. That was a shameless plug for my etsy shop. There may be more. Who are we kidding. There will be more. Art is another great way to incorporate some vintage fall and Halloween decor into your house. Case in point: I found this beauty at Goodwill. It’s called “Autumn Grasses” and was originally a famous Japanese folding screen from the 1800’s by artist Shibata Zeshin. You guys. It has a giant moon, bugs, and the colors are spot on for some subtle Halloween decor. Given my affinity for Winston the skull-snow-globe, this piece of art will be year round in my house. BUT, at these costs you could definitely afford to collect some fall-seasonal specific art and store it in your attic when Christmas rolls around. I don’t have any fall specific art in my shop at the moment (I’m so not parting with that giant-moon-bug print), but I do have a vintage black and white print of the Archbishop of Canterbury who was assassinated way back in 1170. And that’s basically a kissing-cousin story to all those witch-trial tales. A stretch? Maybe. But I just think the print is SO cool and wanted to share it. Planters and ceramics are another great option for some changeable fall decor when the air gets cooler and evening walks require sweaters. This ebony planter with ruffled edging is begging to display some tiny pumpkins. And this Heager bowl and matching candlesticks looks like the fall decor that might have perched atop Grandma’s solid wood record console during happy hour circa 1960. Of course, when all else fails, you can keep your fingers crossed that a real-life mama spider takes up residence on your porch, and your neighbor’s fireplace fills the air with wood smoke, and the evening sky turns that perfect shade of deep purple. When it comes to real life practical magic, this combo wins every time.